Keep the plants in your existing EarthWay Pyramid Terraced Garden (not included) protected from frost with this EarthWay Pyramid Terraced Garden Plastic Cover. This sturdy plastic item stretches over the terrace's support frame to help protect your plants from the elements. The cover has preinstalled grommets, and four included stakes to secure it. Place these stakes near the grommets, and use the included twine to tie the cover to the stake for a taut fit. Add soil around the base of the plastic cover to weight it and prevent whipping in the wind. 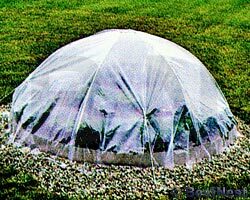 Help protect your small plants from cold and wind using this Pyramid Terraced Garden Plastic Cover. Made in the USA.